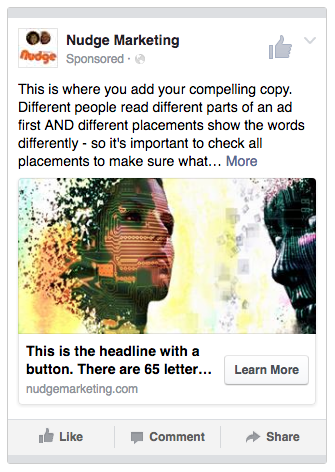 One of the advantages of Facebook Ads is you can create 1 ad that is used across all placements. A disadvantage is how it looks and reads across the different placements. When your Facebook Ad copy was meant to finish with “…try our new dictaphone” and it displays as “…try our new dic” you’ve got a problem! This is a tongue in cheek example to get the point across. Theoretically this should never happen but in practice it does. 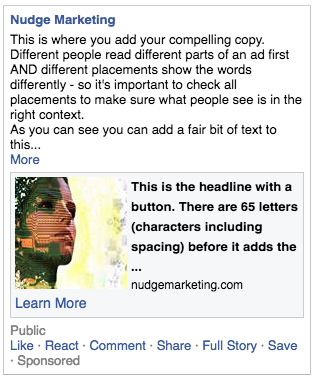 Facebook show each placement, it's up to you to use the arrow buttons to scroll through them. 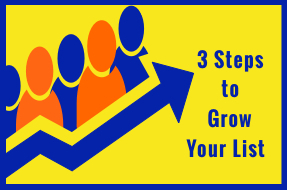 This blog is for you if you’re running Facebook Ads or if you are thinking of running them at some time in the future. 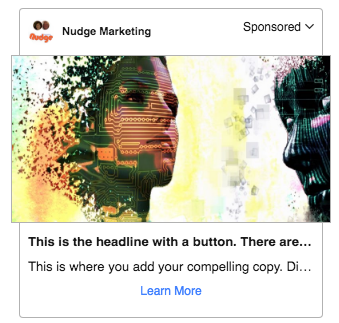 I am showing a standard Link Click ad using a single image and the focus of this article is the TEXT component of the ad and how it looks in the different placement areas. It’s going to be like show and tell, – remember these from your school days, or your kids school days now. 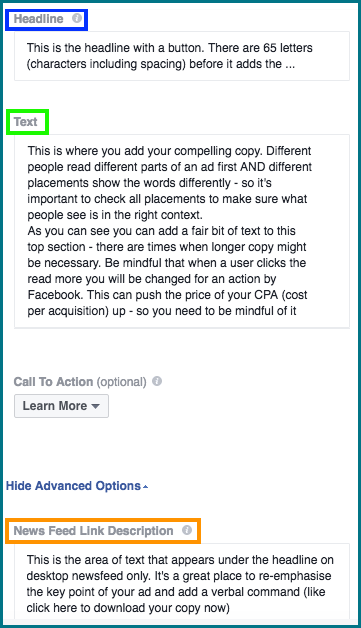 Rather than just tell you what you should do, I’ve created a dummy Facebook Ad showing you what you need to be aware of. Your image should be 1200 x 628. It can have some text on it – less than 25%. 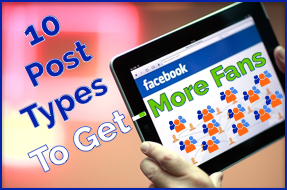 You can check this using the Facebook Image Text Check page – here is the link. This is the website page you want to take the user to. This is the main text that appears in your ad. It appears in different places depending on placement. You have the option to show a button or have no button. 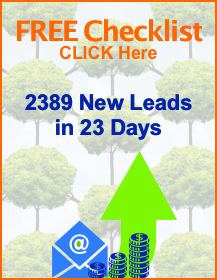 This is something you need to test, do your ads perform better with a button or without a button. This text appears under the Headline on Desktop Newsfeed only. I have shown you this so you can see that there is no limit to the amount of text to add, however you will see further down that only a certain amount of text shows in the different placements. Here is the actual text I typed into each section. 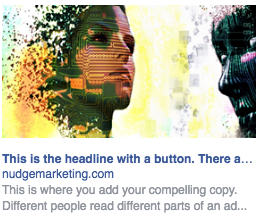 This is where you add your compelling copy. 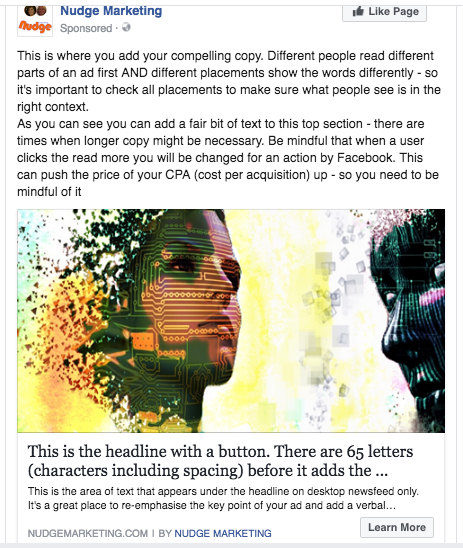 Different people read different parts of an ad first AND different placements show the words differently – so it's important to check all placements to make sure what people see is in the right context. 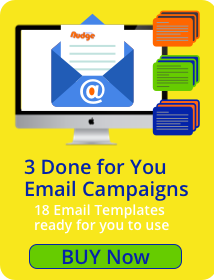 For this example I used the ‘Learn More’ Call To Action Button. There are 2 options at the Ad-Set level for Placements – Automatic (pre-selected) which includes ALL placements (including Audience Network see note in summary) or Edit-Placement. We use the Edit Placement option as it gives us more control of where and therefore how our ads are seen. I have listed the placements below and added a screenshot of how the ad will look. NB: Facebook are constantly making changes to the Ads Manager so what you see may be slightly different to what is shown below. 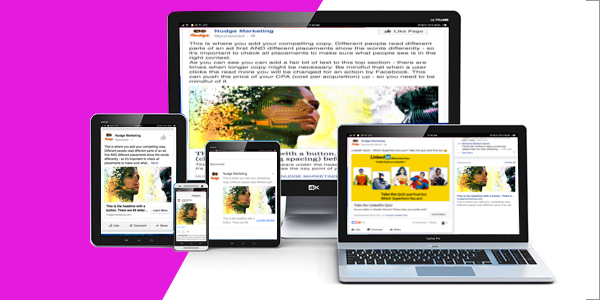 The Mobile News Feed shows how your ad will look on mobiles using either the Android or iOS Facebook app. With over 1.15Billion (over 50%) Daily Active Users (source: Facebook 01/02/17) accessing the platform on mobile it’s critical this placement looks and reads okay. Take note where the Text (210 characters) and Headline (65 characters) cut off. These do vary a little depending on word length. This represents phones that are not using the Android or iOS Facebook app. 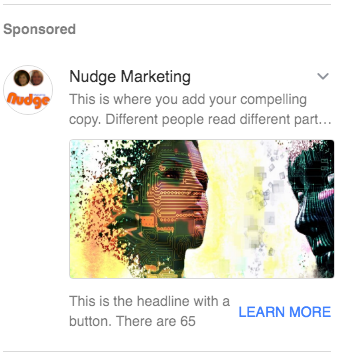 Ads that appear in this placement will be very similar to the right-hand column ads and sometimes only contain text due to the technological limitations of the feature phones. On a feature phone all of the Headline is visible however if the image is not displayed all that will be read is the text. All of the text and headline are displayed however the last few words from the News Feed Link Description have been replaced with as ellipsis (the 3 dots). Instant Articles is Facebooks platform for content publishers – it was originally only available for journalists and influencers to publish newsworthy stories but it is now open to all. This is the ad that shows the least text and headline. If your copy does not suit this style of ad you can choose not to show your ad in this placement. The great thing about Right Hand Column Ads is they just ‘hang’ there on the side of the News Feed, so they are a great option for branding and re-targeting. Both the Headline and Text are cut off (remember the example I gave at the very beginning of this article) that’s from a Right Hand Column Ad. 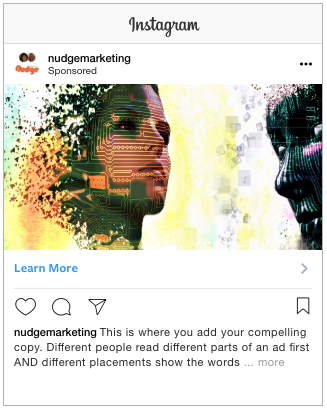 There is no headline shown on Instagram, so your text needs to convey what you want the user to do. If you go for the no button option on Facebook a ‘Learn More’ Button will show on Instagram. The text and headline are all in the same text style and again only a limited amount of text is shown. The Learn More button will appear here if you choose no button. As you can see there are vast differences to how your ads will look, read and therefore feel in each of the placements. 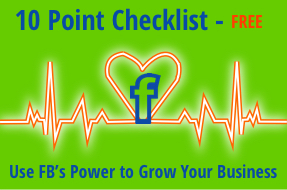 A little forward planning and checking will go a long way towards you getting better results at the best possible price on Facebook. PS I have not talked about the Audience Network Placement in this post on purpose as the way ads display here are vastly different. This placement works well for some, but it has been our experience each time we have tested it that whilst we get a lot of clicks which are typically a lot cheaper but they don’t produce any results.